I’m reluctantly selling my ¾ set in C natural made by Nick Whitmer. The drones, stock and leather bag were made in 2011. The 2 regulators (baritone and tenor) were made in 2013 and the chanter in 2014. The chanter has a wooden chanter top made in 2015. The materials are African blackwood, brass and cherry (mainstock). 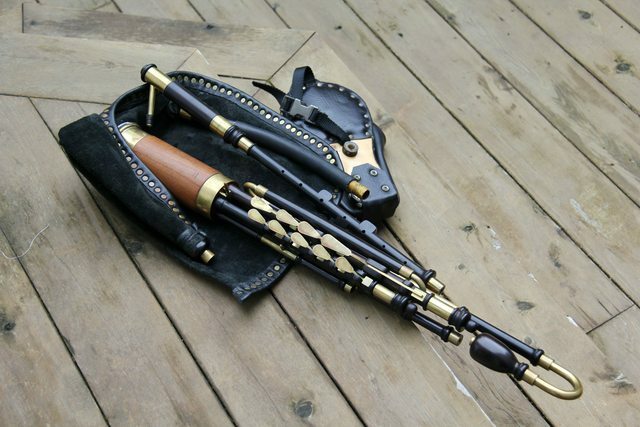 The chanter has a particularly responsive reed which makes it a pure pleasure to play. It has no keys but it has blocks to add 4 keys (Fnat, G#, Bb and Cnat). The bellows was made in 2007 by Seth Hamon: I replaced the gusset in 2010 with double ply leather. Everything is airtight and in tune. I’ll include some spare chanter and regulator reeds and a leather popping strap. I keep the set in a converted tool case which is a little bulky. I’ll include the case if anyone is interested but the shipping costs would probably exceed the value of the case ($40). Reason for sale: Increased work load means I don’t have as much time available for music. I still have a D set (by the same maker), but I don’t have enough time to play 2 sets. Price: US$4,500, o.n.o. Buyer pays shipping and insurance. Paypal accepted.